Work from your calendar, not a to-do list. 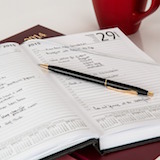 Most successful people don’t use to-do lists to organize themselves; instead, they put everything on a calendar. If something is really important, it should have a slot of your time. Make slots in your calendar for every project. Also, include slots for your personal life—remember to take breaks and make time for recreation. Schedule important items as early as possible. It’s the only way to guarantee that they will be done despite other incoming tasks.